"We are determined to create a bright future while keeping in our mind how their majesties, the emperor and empress, have constantly stayed by the people," said Prime Minister Shinzo Abe at the festival, attended by an estimated 1,800 people. In the morning, the couple was congratulated by the crown prince in a celebratory event at the Imperial Palace attended by other members of the imperial family, including Crown Princess Masako, the emperor's younger son Prince Fumihito and his wife Princess Kiko. 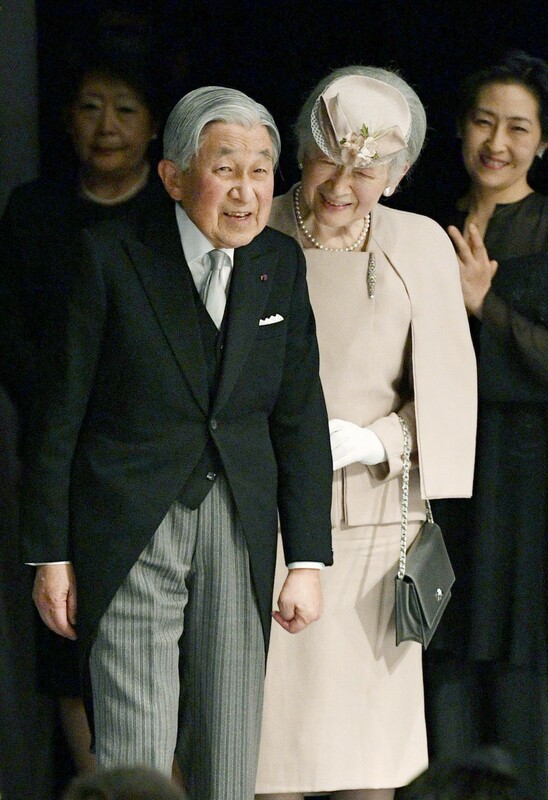 The following is a chronology of major events related to Emperor Akihito and Empress Michiko, who marked their 60th wedding anniversary on Wednesday. Aug. 19, 1957 -- Then-Crown Prince Akihito and Michiko Shoda meet and play tennis against each other in Karuizawa, Nagano Prefecture. April 10, 1959 -- The two marry, making the groom the first crown prince and later the first emperor to be married to a commoner. About 530,000 people throng to see their wedding procession as they ride in a horse-drawn carriage from the Imperial Palace to their residence. Feb. 23, 1960 -- First son, Naruhito, born. March 22, 1963 -- Crown Princess Michiko suffers a miscarriage. Nov. 30, 1965 -- Second son, Fumihito, born. April 18, 1969 -- Daughter, Sayako, born. July 17-19, 1975 -- First visit by the couple to Okinawa, three years after its reversion to Japan from U.S. control, amid mixed feelings among local people toward the imperial family due to Japan having fought Word War II in the name of Emperor Hirohito. Narrowly escape a firebomb thrown at them at the Himeyuri war memorial by leftist activists. Jan. 7, 1989 -- Upon the death of Emperor Hirohito, posthumously known as Emperor Showa, the crown prince ascends the throne and the couple assumes the titles of emperor and empress. The era name changes to Heisei the next day. Nov. 12, 1990 -- Enthronement ceremony is held. July 10, 1991 -- Visit areas affected by a volcanic eruption of the Fugen peak of Mt. Unzen in Nagasaki Prefecture. April 23-26, 1993 -- Visit Okinawa, first trip to the prefecture by an emperor. Oct. 20 -- On her 59th birthday, Empress Michiko collapses, becomes unable to speak for months due to psychogenic aphasia. Feb. 12, 1994 -- Visit Iwoto Island, previously called Iwojima, a fierce battleground in the Pacific during World War II, to pay tribute to the war dead. Jan. 31, 1995 -- Visit Hyogo Prefecture hit by the Great Hanshin Earthquake on Jan. 17. July 26-Aug. 3 -- Visit memorials in atomic-bombed cities of Nagasaki and Hiroshima as well as Okinawa on the 50th anniversary of the end of World War II. July 3-12, 1997 -- Empress Michiko is hospitalized for shingles. Sept. 21, 1998 -- Empress Michiko gives a keynote speech through a video linkup to a congress of the International Board on Books for Young People held in India. June 16, 2000 -- Empress Dowager Nagako, mother of Emperor Akihito and posthumously called Empress Kojun, dies. Sept. 28-Oct. 3, 2002 -- Empress Michiko attends an IBBY congress held in Switzerland, her first solo trip overseas as empress. Jan. 18, 2003 -- Emperor Akihito undergoes prostate cancer surgery. June 27-28, 2005 -- Visit Saipan to honor the souls of war dead on the 60th anniversary of the end of World War II. April 10, 2009 -- Celebrate 50th marriage anniversary. March 16, 2011 -- Emperor Akihito sends a message of hope by video five days after a massive earthquake and tsunami in northeastern Japan triggered a crisis at the Fukushima Daiichi nuclear power plant. March 30-May 11 -- Visit disaster-hit areas in the northeast and shelters around Tokyo for seven weeks in a row. Feb. 18, 2012 -- Emperor Akihito undergoes heart bypass surgery. Nov. 14, 2013 -- The Imperial Household Agency decides to switch to cremation for the emperor and empress rather than burial, which has been the tradition for 350 years, following a proposal by the couple. April 8-9, 2015 -- Visit Palau to pay tribute to war dead on the 70th anniversary of the end of World War II. Aug. 15 -- Emperor Akihito states "deep remorse" over World War II for the first time at an annual memorial ceremony for the war dead. Jan. 26-30, 2016 -- Visit Philippines, pay tribute to the war dead. Aug. 8 -- Emperor Akihito releases video message expressing desire to abdicate and pass the throne on to Crown Prince Naruhito. September 2018 -- Visit areas affected by torrential rains in western Japanese prefectures of Ehime, Hiroshima and Okayama. April 10, 2019 -- Mark 60th wedding anniversary.